Yacktman's US long equity portfolio remained steady at $24B this quarter. Yacktman Asset Management is bullish on Avon Products, PepsiCo, and Procter & Gamble. Yacktman Asset Management is bearish on Apollo Group, Corning Inc., and Hewlett-Packard. This article is the first in a series that provides an ongoing analysis of the changes made to Donald Yacktman's US stock portfolio on a quarterly basis. It is based on Yacktman Asset Management's regulatory 13F Form filed on 05/06/2014. Donald Yacktman founded Yacktman Asset Management in 1992. His management style focuses on buying great companies when they are down and holding them until the stock price recovers (which such company stocks always do). The typical business he chooses to invest has low fixed assets and low cyclicality - those two factors combine to ensure high returns over the long-term. Donald Yacktman is a bottom-up value investor. He views every stock as though it is a long-term bond - industry behemoths such as Coke, Wal-Mart, etc. would parallel the risk-assessment of a triple-A bond and smaller growth companies would get viewed in the context of junk bonds. The firm has over $30B in Assets Under Management (AUM) and is holding over 20% cash at the moment. His cash position is known to increase as market goes up and vice-versa: during the financial crisis in 2008, the cash position dropped to 0% and since then has been going back up as the market rallied. The portfolio is concentrated with recent 13F reports showing around 50 individual positions. This quarter, Yacktman's US long portfolio remained almost steady at $24B. The number of holdings decreased from 51 to 47. The largest holding is PepsiCo Inc. at 11.49% of the US long portfolio. Largest five individual stock positions are PepsiCo Inc., Procter & Gamble, Twenty First Century Fox, Coca-Cola Company, and Cisco Systems and they together account for just over 40% of the US long portfolio. Avon Products (NYSE:AVP): AVP is a 1.52% of the US long portfolio position. The original stake was a 15M share position established in 2011 at prices between $16 and $29. The stake was increased to 18.9M shares by the end of 2012 at prices between $14 and $23. This quarter saw further buying as the position size was increased by about one-third at prices between $14.28 and $17.22. The stock currently trades well below his purchase ranges at $13.60. The aggressive stake build-up indicates a clear bullish bias. For investors attempting to follow Yacktman, AVP is a very good option to consider. C.H. Robinson Worldwide Inc. (NASDAQ:CHRW): CHRW was an insignificantly small position (~700K shares) first purchased in 2012. During Q1 and Q2 2013, ~5.4M shares were purchased at prices between $54 and $67. The stock currently trades at $58.30. The last three quarters saw minor buying and the stake currently stands at 1.44% of the US long portfolio. The activity indicates a mild bearish bias. Coca-Cola Company (NYSE:KO) and PepsiCo Inc. (NASDAQ:PEP): KO and PEP are very long-term positions that have been in the portfolio for over fifteen years. 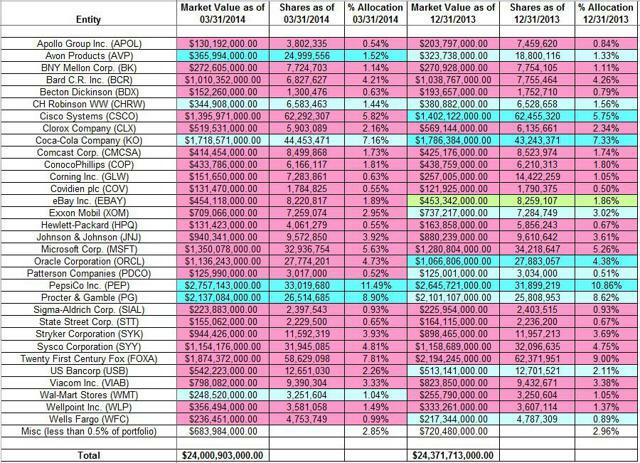 During Yacktman's first 13F filing in Q1 1999, the positions consisted of just a few thousand shares each. The KO stake was built up to almost 2.4M shares by Q4 2006. The position size dropped below 1.5M shares in Q4 2008 but since then the stake was consistently increased - the position doubled in both 2009 and 2010 and increased by ~150% each in 2012 and 2013. The huge stake build-up happened at prices between $21 and $30 and $33.50 and $43 in the 2009-10 and 2012-13 periods respectively. This quarter saw some minor additional buying. The stock currently trades at $40.87 and the position stands at 7.16% of the US long portfolio. The activity indicates a clear bullish bias. The even larger 11.49% PEP stake was similarly built-up over multiple years with the bulk of the buying happening in the 2011-13 timeframe - over 22M shares were purchased during that time at prices between $60 and $86. The stock currently trades at $87. This quarter saw a 3.33% stake increase at prices between $77 and $83.50. Procter & Gamble (NYSE:PG): PG is another very long-term position that has been in the portfolio since Yacktman's first 13F filing in 1999. The position size remained insignificantly small until 2007 when about 520K shares were purchased at prices between $61 and $74. The position was cut in half in 2008 but the following four-years saw a 100-fold stake increase at prices between $47 and $70. The position has remained relatively steady in the last five quarters although adjustments were made every quarter. The stock currently trades at $82.39. Wal-Mart Stores (NYSE:WMT): WMT is a long-term position that was first purchased in 2004. The bulk of the current position was purchased in 2011 when around 2M shares were acquired at prices between $50 and $60. The stock currently trades at $79.20. This quarter saw a minor stake increase and the position now accounts for 1.04% of the US long portfolio. Apollo Group (NASDAQ:APOL): APOL is a small 0.54% of the US long portfolio position that was reduced by ~50% this quarter at prices between $26.90 and $35.24. The stock currently trades at $28.61. The original position consisted of ~2.9M shares purchased in 2010 at prices between $34 and $65. The position was built up to ~7.5M shares by 2012 and since then had been kept steady. The activity this quarter indicates a clear bearish bias. Yacktman realized long-term losses from this position. C.R. Bard Inc. (NYSE:BCR): BCR is a 4.21% of the US long portfolio position that was reduced by ~12% this quarter at prices between $125 and $148. The original position consisted of ~2.14M shares purchased in 2010 at prices between $76 and $96. The stake was built up to just over 7.4M shares by 2012 and since then has seen some trimming. Becton Dickinson (NYSE:BDX): BDX is a small 0.63% of the US long portfolio position first purchased in 2010 at prices between $67 and $85. The position was doubled in 2011 at prices between $71 and $89 but has since been reduced. This quarter, the stake was reduced by around one-fourth at prices between $105 and $117. The stock currently trades at around $117. Yacktman is harvesting long-term gains from this position. Corning Inc. (NYSE:GLW): GLW is a small 0.63% of the US long portfolio position that was reduced by almost half this quarter at prices between $17 and $20.82. The stock currently trades at $20.74. The stock has been in the portfolio since 2010 and the bulk of the current position was purchased in 2011 at prices between $12 and $23. The significant selling this quarter indicates a bearish bias. 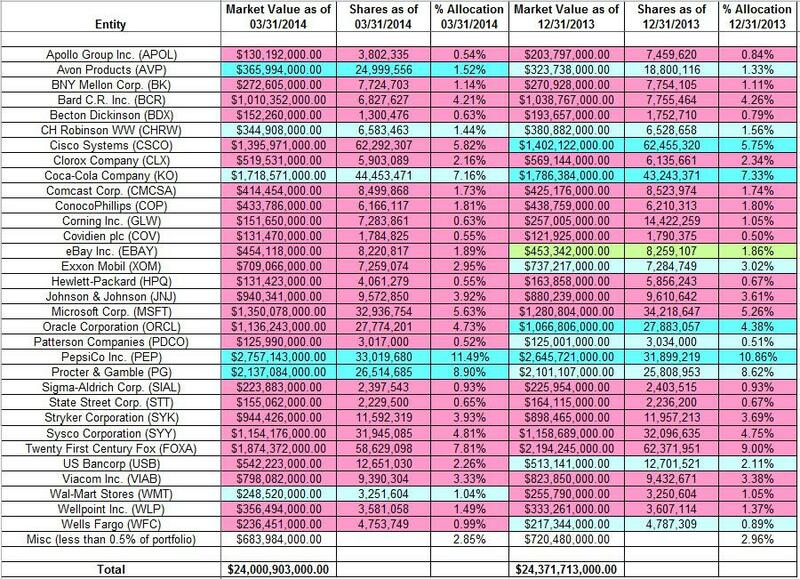 Hewlett-Packard (NYSE:HPQ): HPQ is a small 0.55% of the US long portfolio position that was reduced by around 30% (~1.8M shares) this quarter at prices between $27.45 and $32.56. Another large chunk (~3.3M shares) was also sold in Q3 2013 at prices between $21 and $27. Most of the current position was acquired in 2011 at prices between $22 and $49. The stock currently trades at $32.36. The large stake reductions over multiple quarters indicate a clear bearish bias. Microsoft Corporation (NASDAQ:MSFT): MSFT has been in the portfolio since 2003 and it became a significantly large position in 2006 when around 2.2M shares were purchased at prices between $22 and $29.50. The bulk of the current 5.63% of the US long portfolio position was established in 2011 when ~20M shares were purchased at prices between $24 and $28.50. This quarter saw the stake increased by 3.6% at prices between $35 and $41. The stock currently trades at $39.54. Stryker Corporation (NYSE:SYK): SYK is a 3.93% of the US long portfolio position first purchased in 2009. The majority of the current stake was established in 2012 at prices between $50 and $57. The position has since been trimmed slightly over the last four quarters. The stock currently trades at $80.62. Yacktman has a large exposure to the healthcare industry, a group that also includes Johnson & Johnson, C.R. Bard, Covidien, Sigma-Aldrich, and WellPoint. Twenty-First Century Fox (NASDAQ:FOXA): Yacktman had a very small position in News Corporation (NASDAQ:NWS) in 2008. The 2009 to 2012 timeframe saw a huge stake build up as the share count increased 32-times (2.5M shares to over 80M shares). Since the spinoff and renaming of News Corporation, both positions have seen selling - the NWS stake was eliminated in Q4 2013 and the FOXA stake has so far been reduced by around 28%. This quarter saw a 6% trimming at prices between $30.73 and $35.63. Yacktman's average cost-basis on this position is very low. He is continuing to harvest large gains. The Bank of New York Mellon Corporation (NYSE:BK), Cisco Systems (NASDAQ:CSCO), Clorox Company (NYSE:CLX), Comcast Corporation (NASDAQ:CMCSA), ConocoPhillips (NYSE:COP), Covidien plc (COV), eBay Inc. (NASDAQ:EBAY), Exxon Mobil (NYSE:XOM), Johnson & Johnson (NYSE:JNJ), Oracle Corporation (NYSE:ORCL), Patterson Companies (NASDAQ:PDCO), Sigma-Aldrich Corporation (NASDAQ:SIAL), State Street Corporation (NYSE:STT), Sysco Corporation (NYSE:SYY), U.S. Bancorp (NYSE:USB), Viacom Inc. (NASDAQ:VIAB), WellPoint Inc. (WLP), and Wells Fargo (NYSE:WFC): These are significant positions (more than 0.5% of the US long portfolio) that were reduced marginally (less than ~2% change in position size) this quarter. As the activities were very minor, they do not indicate a clear change in bias. Yacktman is known to shy away from investing in banks but it is interesting that he has held significant stakes in three banks since the financial crisis: The Bank of New York Mellon (1.14%), US Bancorp (2.24%), and Wells Fargo (0.99%). Disclosure: I am long CSCO. I wrote this article myself, and it expresses my own opinions. I am not receiving compensation for it (other than from Seeking Alpha). I have no business relationship with any company whose stock is mentioned in this article.